Vary the hand placement on different exercises for maximum shoulder building. People won’t see the results of the work you do to create athletic, toned arms and legs when you’re wearing slacks and jackets. Still, a broader shoulder line looks good beneath the blouses you wear to work, in a cocktail dress, on the tennis court or in the pool. Women don’t need a barbell set and heavy weights to broaden shoulders, however. There are many effective exercises you can perform that require only simple movements. Unlike toning or cardio resistance exercises, you’ll need to perform muscle-building workouts using slow reps and more weight. Use enough weight for each exercise so that you’ll fatigue to failure within 90 seconds. Perform eight to 12 repetitions of the exercise to create a set. After a one-minute rest, repeat the set. Do three to five consecutive sets per workout, depending on how much time you have. Don’t let your weights drop after you lift them, and don’t bounce back up after you lower weights or you won’t get the important muscle contractions that help you increase your strength. If you have dumbbells or kettlebells, add lateral raises to your workouts. Start with your weights at your sides, with your arms straight and your palms facing your hips. Slowly raise the weights out from your body until you form a "T." Hold this position for two seconds, then slowly lower the weights. If you have access to a weight machine, perform wide-grip pulldowns. Stand, sit or kneel under the bar designed for this exercise. Grasp the bar with your palms facing away from you and your hands outside your shoulders. Slowly pull the bar down behind your head. Hold for one or two seconds, then let the bar rise, resisting it, rather than letting it go back up by itself. Alternate this exercise by pulling the bar down in front of your head, by performing it with your hands facing you and pulling the bar down in front of your head. Pushdowns are similar to pulldowns, but you start the exercise with the bar at chest height. Starting from this position, push the bar down until your arms straighten. Hold for one or two seconds, then let the bar come back up to your chest, resisting it on the way up. Vary your hand placement to see which muscles this emphasizes. Perform flyes standing or sitting with dumbbells to help build your upper body. Start with a dumbbell in each hand and your arms straight in front of you. Your palms should face each other and your hands should almost touch in front of your chest. 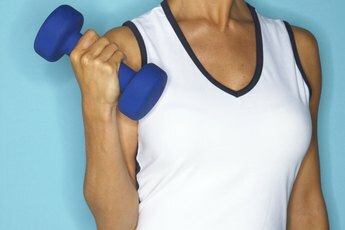 Move the dumbbells slowly backward, bending your elbows as you start to feel stress against them. Form a "T" with your body as your arms straighten out at your sides. Hold this position for one or two seconds then bring the dumbbells back together in front of you with a slight bend in your elbows. Stand in an athletic stance with your feet about shoulder-width apart. Hold two weights down at your sides with your palms facing behind you. Lift the weights straight forward until your arms are straight out in front of you, parallel to the ground -- think of a zombie and you get the picture. Hold this position for two seconds and slowly lower the weights. Don’t let them drop to maximize your benefit. 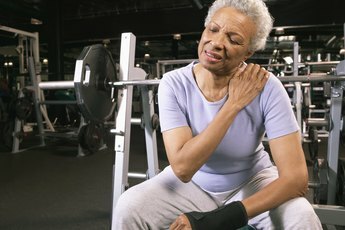 To work your shoulders even more, don’t lower the weights all the way until tension goes out of your muscles. Stop while you’re still resisting the weights, count to one or two, then raise them again. Be careful not to twist your torso as you fatigue, or use your back to help you, to avoid back strain.